CROSS DJ is a MIDI DJ software for Windows and MAC platforms. MixVibes drew from its experience in audio engine to deliver a new pro-DJ product that brings more efficiency and simplicity to the mix. 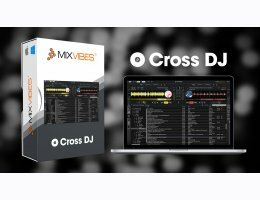 CROSS DJ delivers the best of MixVibes’ know how in DJ software in a solid and back to basics package! This software will satisfy the expectations of professional DJs who need a powerful and reliable DJ tool. With CROSS DJ, it's easy to find and prepare your audio medias, allowing you to keep your focus on the dance floor. User definable smart lists with dynamic update whenever you add matching songs. "Prepare" pane to organize and prepare your set. Flag your tracks with color labels and find them back within seconds. Album browser for visual search. History node to keep record of all your played tracks/sessions. Advanced ‘info’ tool to edit any tag field. CROSS DJ includes a lot of advanced features, allowing you to release your creativity to make every mix differents. Automatic and Manual loops, locators, auto beat matching. Effect synchronization on music beat/tempo. High-end master tempo and hybrid pitch allowing speed change while keeping the original tonal Key (note). CROSS DJ is compatible with numerous MIDI controller. If your controller is not listed below, you can map your own controller with the MIDI Learning feature.